Whether your dream long weekend trip with kids involves exploring the Adirondack wilderness, splashing down a waterslide or relaxing with calm lake views, there are many amazing places to choose from near New York City. 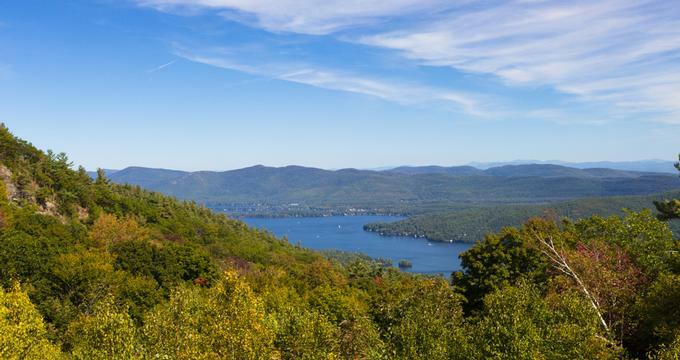 Visit the historic estates in the Hudson Valley, stay on a working farm in upstate New York, hike in the Catskill Mountains, sunbathe on the beaches of Long Island, or check into a full service resort on the banks of Lake George, NY. 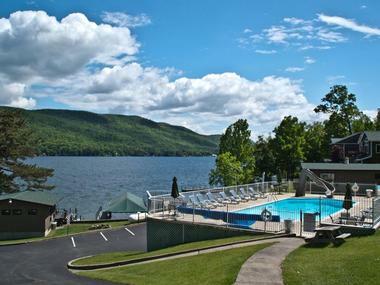 Set on 15 acres of Adirondack wilderness on 1,000 feet of sandy Lake George beach waterfront, the Sun Castle Resort is spacious, luxurious, and cozy. It offers private villas and Townhouses featuring one or two bedrooms, with their own private deck overlooking the lake. They are beautifully decorated in a modern, comfortable style and have fireplaces, fully equipped kitchens, large private baths, and all modern amenities. Taking kids on a vacation always fills parents with the worry about how to keep them occupied and entertained. Let the experts take over by bringing them to the all-inclusive, endless-fun Rocking Horse Ranch Resort. Set in the Hudson Valley on a 500-acre property with a private lake and beautiful verdant nature, the resort has fun activities for all ages and interests. There is unlimited horseback riding, mountain tubing, kayaking, paddle boats, banana boats and fishing on the lake. Kids can have fun in the outdoor heated pools with water slides and at Big Splash indoor waterpark with a 250-ft long indoor flume. Adventurous kids can test their courage and strength on bungee jump and rock climbing walls. Other fun family activities at the resort include mini golf, basketball, tennis, a kids’ fun barn and Lucky Horseshoe Arcade with mini bowl. 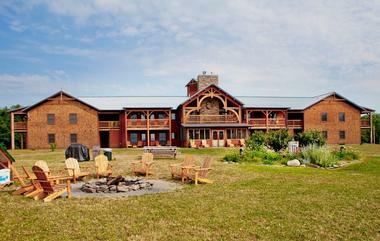 Families are accommodated in two cozy lodges featuring rooms that can accommodate groups of all sizes. Three delicious, all-you-can-eat meals are included in the cost of your stay. Located on the sandy shore of Mirror Lake just a few minutes from the Lake Placid gourmet restaurants and exclusive shopping and surrounded by the lush wilderness of the Adirondack Mountains, Golden Arrow is a refuge from daily stress. It seamlessly combines luxury pampering and respect for the surrounding natural wonders. The resort’s 165 spacious, luxuriously appointed suites and rooms offer breathtaking views of Mirror Lake and forested mountain slopes. All rooms have flat-screen TVs, free Wi-Fi, Nintendo games consoles, and coffeemakers. Many also feature private patios and balconies. Suites and some rooms also have fireplaces, kitchenettes, and whirlpool tubs. Everything guests can possibly need is available right in the hotel: an indoor pool, high end boutiques, a health club, shops, snacks, and the gourmet seafood restaurant Generations. And when the kids fall asleep, mom and dad can enjoy a cocktail lounge and Roomers Nightclub. Perched on top of the hill on Hope Lake in the Virgil Valley, Hope Lake Lodge is a luxurious hotel located in the town of Cortland in the scenic Finger Lakes Region of Central New York. The grand, imposing timber-framed structure has 106 rustic, beautifully decorated suites with two bedrooms and 1-3 bathrooms, fireplaces, fully equipped kitchens, dining rooms, cable TV, Wi-Fi and pullout sofas. They can sleep up to 10 people. 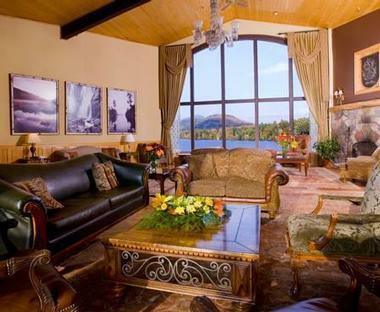 Some suites have beautiful views of the surrounding lakes and mountains from private balconies. 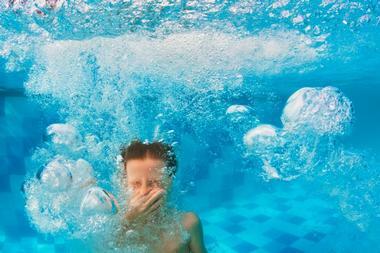 The lodge-style resort hotel is a delight for the kids with its indoor water park and an outdoor pool in season. For the adults, there is a soothing spa, a hot tub, a fitness center, and several options for great dining and cocktails. As you drive down the forested slopes of the scenic Adirondack Mountains, you will suddenly arrive at the shimmering waters of Saranac Lake. With old trees reflected in the clear water, it is an idyllic scene of peace and tranquility, so close to several big cities and so far away from the stress and noise. Ampersand Bay Resort is spread on 28 acres on Lower Saranac Lake, right on the sandy shores, and it is perfect for swimming, fishing, canoeing, or lounging in the shade. Accommodation ranges from superbly decorated wood and stone luxury suites, luxury camping in the charming rustic cottages, or private modern cabins. 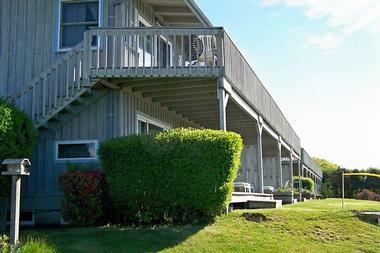 All accommodations offer full kitchens, private bathrooms, two or three spacious bedrooms, and one to three bathrooms. Some have private porches or balconies, Adirondack chairs, picnic tables, dining tables, rainfall showerheads, and Jacuzzi tubs. Wi-Fi is free in the communal areas. 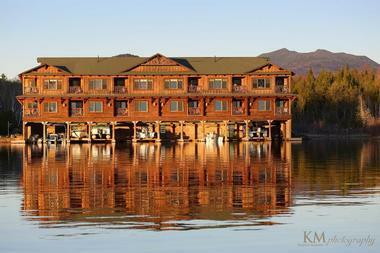 Nightly campfires, free use of the kayaks, canoes, and pedal boats are available for all guests. The lake is full of bass, bullhead, and pike for avid fishermen. You cannot be closer to the action in lively Lake Placid than you are when you stay in historic Hotel North Woods, right on Main Street. 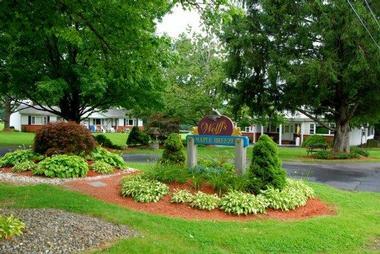 The hotel is just a short walk to the Olympic Arena, the Lake Placid Convention Center, and Mirror Lake Beach. This completely renovated and modernized historic inn originally built in 1897 now features 92 luxury suites with spectacular views of High Peaks, Mirror Lake, and Whiteface Mountain. Hillside Suites also have private balconies. All suites are modern and spacious with satellite TVs, free Wi-Fi, private bathrooms with separate vanities, and coffee makers. Some suites also have kitchenettes with microwaves and fridges. Guests are invited to enjoy Delta Blue restaurant with a Southern theme, Memphis-style barbecue, and live music right on the ground floor of the hotel. Take away their PlayStations, iPads and cell phones and take the kids to the 300-acre Hull-O Farm on a vacation that will bring them closer to the real world of hard work and that will help you reconnect as a family. They will get to play with the puppies, kittens, baby chicks, tiny goats, and fluffy rabbits. They can climb a pile of hay, get lost in a corm maze, or stumble through the pumpkin patch. 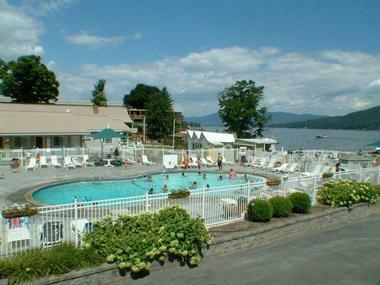 Located on the sandy banks of Lake George in the heart of the scenic Adirondack Mountains, Marine Village Resort is the perfect place for the entire family. Comfortable, spacious rooms with fridges, TVs, microwaves, toaster ovens, free Wi-Fi, and wonderful views of the pool or the lake are perfect if you travel with the kids and need a bit of home away from home. Hanging out by the large pool surrounded by the spacious terrace with lounge chairs and umbrellas is just one option for a relaxed day. You can try boating or paddling on the lake and take a short walk to the House of Frankenstein Wax Museum or along the lovely shady trails through the Adirondacks, which are great for the more active family members. The resort’s own restaurant Morgan’s can take care of your hunger, and the kids eat for free. 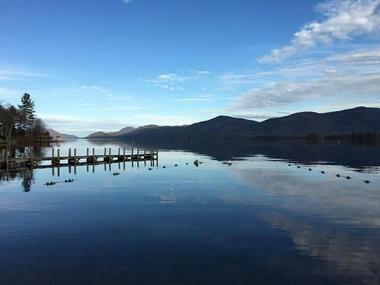 About half way between New York City and Montreal, Canada, Lake George has been a popular tourist destination for more than a century. People love its clear, deep water surrounded by the unspoiled forests of the beautiful Adirondacks. Blue Lagoon Resort is snuggled on the very edge of the lake on about 200 feet of sandy shore with cottages and a motel, which are so close to the water that everyone can have a morning coffee on the beach in their Adirondack chair lined up in front of the room. In the heart of the six-million-acre magnificent Adirondack Park and just a short drive from Lake Placid, The Whiteface Lodge is a beautiful hotel nestled among the stately aspens and firs. Upon walking inside, you’ll feel as though you have stepped back in time with the lodge’s soaring high wood-beamed ceilings, cozy sitting rooms with cast-iron fireplaces, and plush carpets strewn around. It is a mountain sanctuary at its best. All suites, from studio Junior Suites to the four-bedroom palatial Presidential Suite, are beautifully decorated in the signature Adirondack style with sturdy wooden furniture that is often handcrafted. Bathrooms are opulent and feature jetted tubs. Suites have flat-screen TVs, free Wi-Fi, kitchens, fireplaces, and much more. The resort’s guests can enjoy a movie theater, serene spa, fitness center, indoor and outdoor pools, steam room, canoeing, bowling, and ice-skating. Kanu restaurant and lounge are there for a gourmet meal or some excellent cocktails. Clean and bright on the outside and luxurious and opulent on the inside, Villa Vosilla is an Italianate beauty perfectly fitting the lush landscape of the Great Northern Catskills and the Upper Hudson Valley. Located in the quaint village of Tannersville in Hunter, New York, this lovely hotel offers 70 spacious rooms that seamlessly blend old world elegance, vintage décor, and contemporary amenities. 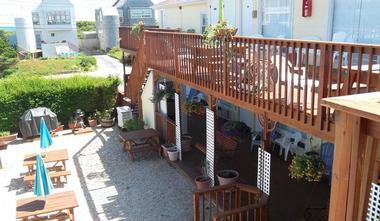 Each room has a private bathroom, air conditioning, cable TV, and phone, and most have a patio or a balcony. There is free Wi-Fi in the common living room. Guests can enjoy a splash in two swimming pools, a luscious Italian cuisine at the Ladoria Ristorante, and fine cocktails and snacks in Ld Lounge. The lounge also serves as a venue for frequent nightclub shows, dance shows, and music evenings. Village of Montauk is in a world of its own. Surrounded by water on three sides with magnificent undeveloped beaches and parks, it is a place that attracts families, hikers, bird watchers, fishermen, and anyone else looking for a bit of unspoiled nature. Beach Plum Resort is family haven, where each room has a view of the sea, a private deck, and direct access to the beach. Studios, one or two bedroom units, and cottages all have private kitchens, indoor and outdoor bathrooms, free Wi-Fi, and TVs. There are lovely grassy areas for the kids to play in when they are not on the beach and bikes for those who want to explore farther inland. The Sullivan is Ramada’s luxury hotel and event center in the Rock Hill, New York, where it is surrounded by 55 acres of unspoiled nature of the scenic Catskill Mountains. The hotel’s 70 luxuriously decorated and appointed suites and rooms have all modern amenities such as flat screen TVs, movies on demand, Jacuzzi tubs, luxury linens, Wi-Fi, a coffee bar, and small fridges. Guests have access to the spa, health club, and large indoor pool. Bernie’s Holiday Restaurant and Crust Italian Eatery offer gourmet meals, and the hotel’s catering hall and Grand Ballroom can accommodate up to 1000 guests for special events. 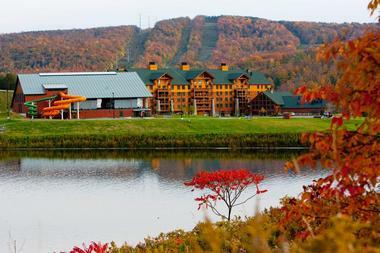 Wolff’s Maple Breeze Resort is not for the lazy. Located on 300 acres in the Catskill mountains with three private lakes stocked with fish, a king size pool, a driving range, a volleyball court, and shady trails through the wild Catskills, it is the ultimate summer fun location, where there is something going on all the time and there is not one single boring moment. Sunbathe on the patio, sing karaoke, play bingo by the pool, or try your hand at handball, ping pong, badminton, basketball, shuffleboard, or horseshoes. Kids have their own fun specially organized for them. All meals are included and are served in the resort’s large, family-style dining room. And when you are totally exhausted, rest in your spacious, clean, cozy room with nice décor, air conditioning, cable TV, and refrigerator. There is a sense of peace and serenity when you look at the wildflower-filled Susquehanna Valley from the balcony of your suite in August Lodge. This charming mountaintop retreat has 25 suites in picturesque two-story timber frame structure, where each suite opens up to the wrap-around porch. Country-style décor makes suites feel cozy and homey, and they boast fully equipped kitchen, full private bathrooms, satellite TVs, free Wi-Fi, and air-conditioning. Guests have access to the indoor pool and modern soothing spa. The Baseball Hall of Fame is within walking distance of the August lodge, and the popular Cooperstown Dreams Park is only a mile away. If you care to count them, there are exactly 65 steps from your pleasant ocean view room at the Ocean Resort Inn to the beach. This cozy Montauk waterfront resort is only a short walk away from downtown and all the great seafood restaurants and shops, and it is perfectly located to serve as your base for exploring the surrounding beaches, wineries, or boat tours. All rooms are pleasantly decorated and have private bathrooms, free Wi-Fi, cable TVs, microwaves, fridges, and Jacuzzi tubs. Right in front of the inn is a nice courtyard overlooking the ocean, where you can relax in a hammock, have a cup of coffee in a porch swing, or work on your tan in a lounger while watching the kids playing in the shallows. Bikes are available for the guests when they get the urge to explore. Tannersville is the place to visit when you want to explore the magnificent nature of Northern Catskills and indulge in all this unspoiled area offers: skiing, cross-country skiing, snowboarding, snowshoeing, ice-fishing, and snowmobiling in the winter or hiking, biking, camping, fishing, swimming, and golfing in the summer. Hotel Mountain Brook is just a short walk from the town center, a lovely brick structure with charming wrap-around rustic porch that is surrounded by a well-maintained lawn and bright flowerbeds in warmer seasons. Rooms and suites are located in two buildings and are all beautifully decorated in charming rustic décor with all modern amenities, which include TVs, free Wi-Fi, DVD players, private bathrooms, and whirlpool tubs. Some rooms have fireplaces, sitting rooms, porches, and/or balconies. The hotel’s private luxury cabins also have large porches, spacious, comfortable sitting rooms, and oversized Jacuzzi tubs. Free breakfast is served in a lovely dining room by the fireplace. Guests can also have a relaxing moment on the wraparound porch overlooking the mountain or have a quiet moment with a book in the library.